The Illinois Central Railroad bought fifty "Berkshire" type locomotives from the Lima Locomotive Works in 1926. They were designated as Class A-1 and numbered 7000 through 7049. Numbers 7000 through 7039 had Elesco feed water heaters and numbers 7040 through 7049 had Worthington BL feed water heaters. The IC then purchased the Lima A-1 demonstrator and numbered it 7050. This is the very same demonstrator that was tested in the Berkshire Hills for the Boston & Albany and later went on the road to sell this new class of locomotive for Lima. These superpower locomotives designed and tested for rugged mountainous service on heavy grades were used on a nearly flat division of the Illinois Central. 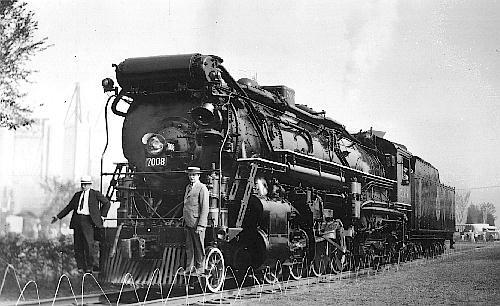 These locomotives had 63 1/2" diameter drivers, except number 7050 had 63" diameter drivers, 28" x 30" cylinders, a boiler pressure of 240 psi with a resultant tractive effort of 68,850 pounds (69,400 pounds for number 7050). Each weighed 388,000 pounds except number 7050 weighed 385,000 pounds. These Class A-1 locomotives provided the inspiration for the Paducah sandbox on the number 2500 through 2600 4-8-2s and later versions of locomotives in the fleet. As the Paducah, KY shops embarked on the rebuilding program in 1937, they converted #7038 into a 4-6-4 Hudson with the intent to convert all 2-8-4s to this wheel arrangement for use in high speed merchandise freight service. This locomotive was numbered 1 until 1945 when it was renumbered 2499. It was scrapped in 1950. As this was one of the few failures from Paducah they upgraded the remaining locomotives as 2-8-4s and renumbered them 8000 through 8049. The IC called them "Limas", but the enginemen called them "Big Mikes". These 2-8-4s lost their most Lima-distinguishing characteristic, the feed water heater that hung over the brow of the smoke box door. With this change and some others these locomotives assumed the standardized look and design of Illinois Central motive power. The rebuilds provided the railroad with locomotives that weighed 393,000 lbs and had 63 1/2" diameter drivers, 27" x 30" cylinders and exerted 77,578 pounds of tractive effort under 265 psi of boiler pressure. Data from table in 1930 Locomotive Cyclopedia and IC 9 - 1928 Locomotive Diagrams supplied in May 2005 by Allen Stanley from his extensive Rail Data Exchange. (Many thanks to Chris Hohl for his 22 September 2017 email reporting unlikely boiler pressure values for 177 entries. A Locobase macro caused the error .) Works numbers were 7136-7160 in November 1926, 7161-7185 in December 1926. The first 40 engines had Elesco feedwater heater, the last 20 used Worthingtons. Valve motion had limited cutoff, piston valves measured 14" (356 mm) in diameter. The very first 2-8-4 was originally built as a demonstrator locomotive, then sold to the IC. Boston and Albany A1 (Locobase 46) and Boston and Maine T-1s (Locobase 47) were very similar. Drury (1993) says these engines "rode poorly above 40 mph, sometimes so roughly that the reverse gear wheel would suddenly spin into full forward gear. When that happened the throttle had to be closed at once and the valve gear returned to the proper position -- and several engineers broke an arm doing so." (203) The trailing truck also had a tendency to derail when backing up. Paducah converted 7038 to a 73 1/2" drivered 4-6-4; see Locobase 1357. There's some evidence that the IC intended to convert the whole class. An IC Locomotive Diagram book dated 12-11-1937 and supplied by Allen Stanley in August 2013 from his extensive Rail Data Exchange held two diagrams labelled 8000-8049. Both show the entire 2-8-4 class converted to 4-6-4s and rollling on 73 1/2" drivers. Data from table in 1930 Locomotive Cyclopedia and IC 1955 Locomotive Diagrams supplied in August 2013 by Allen Stanley from his extensive Rail Data Exchange. As noted way back in Locobase 49, these 2-8-4s were not completely satisfactory as delivered. The IC's Paducah shops oversaw perhaps the most extensive rebuilding program of any railroad, reworking hundreds of locomotives to address shortcomings or meet new needs. So it was with the 7000s. Modifications undertaken in 1939 reduced cylinder size by an inch to 27" (686 mm) while retaining the 14" (356 mm) piston valves. The boiler's layout came from the single 4-6-4 (Locobase 1357) converted from 7038. The design abandoned the Type E superheater and substituted the older, but more easily maintained Type A. Apparent superheater area dropped by 36%, but the ratio to combined heating surface area remained relatively high. To compensate for the smaller cylinder volume, the the IC raised the BP setting to 265 psi (18.25 bar). The trailing truck's booster was also removed. Most of the class retained the thermic syphons in their fireboxes. Some of the class had their fireboxes refitted with five circulators offering 109 sq ft (10.1 sq m) of heating surface area. Direct heating surface area fell slightly to 389.4 sq ft (36.5 sq m). Locobase shows that version in the specifications accompanying this entry. Still others dispensed with syphons or circulators and included only 53.4 sq ft (4.95 sq m) of arch tubes; these had a total evaporative heating surface area of 4,709 sq ft (437.5 sq m). Weight distribution between the drivers and the trucks changed considerably, most likely to relieve the trailing truck of some of its considerable burden. So while adhesive weight increased by 23,400 lb (10,614 kg), overall engine weight grew by only 5,500 lb (2,495 kg). Tender capacity grew by four tons of coal, but water capacity remained the same. Virtually the entire class served the IC until their retirements in the mid-1950s.